[S15] George Edward Cokayne, editor, The Complete Baronetage, 5 volumes (no date (c. 1900); reprint, Gloucester, U.K.: Alan Sutton Publishing, 1983), volume II, page 333. Hereinafter cited as The Complete Baronetage. Maria Campbell was the daughter of Sir Colin Campbell of Glenorchy and Catherine Ruthven.2 She married, firstly, John Graham, 6th Earl of Menteith, son of William Graham, 5th Earl of Menteith and Margaret Douglas, circa 22 October 1589.3 She married by contract, secondly, Hon. Colin Campbell of Lundie, son of Colin Campbell, 6th Earl of Argyll and Lady Anne Keith, on 26 June 1599.1 She died after 14 December 1618. She was also known as Mary Campbell.3 After her marriage, Maria Campbell was styled as Countess of Menteith circa 22 October 1589. From circa 22 October 1589, her married name became Graham. From 26 June 1599, her married name became Campbell. [S15] George Edward Cokayne, editor, The Complete Baronetage, 5 volumes (no date (c. 1900); reprint, Gloucester, U.K.: Alan Sutton Publishing, 1983), volume II, page 315. Hereinafter cited as The Complete Baronetage. 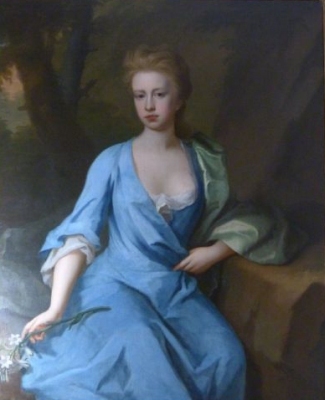 After her marriage, Lady Anne Campbell was styled as Countess of Bute circa 19 February 1710/11. From circa 19 February 1710/11, her married name became Stuart. From 19 September 1731, her married name became Fraser. [S6] G.E. Cokayne; with Vicary Gibbs, H.A. Doubleday, Geoffrey H. White, Duncan Warrand and Lord Howard de Walden, editors, The Complete Peerage of England, Scotland, Ireland, Great Britain and the United Kingdom, Extant, Extinct or Dormant, new ed., 13 volumes in 14 (1910-1959; reprint in 6 volumes, Gloucester, U.K.: Alan Sutton Publishing, 2000), volume II, page 441. Hereinafter cited as The Complete Peerage. [S68] H. Pirie-Gordon, editor, Burke's Genealogical and Heraldic History of the Landed Gentry, 15th edition, (London, England: Burke's Peerage Ltd, 1937), page 341. Hereinafter cited as Burke's Landed Gentry, 15th ed. He succeeded as the 2nd Lord Mountstuart, Cumra and Inchmarnock [S., 1703] on 4 June 1710.1 He succeeded as the 4th Baronet Stuart, of Bute [N.S., 1627] on 4 June 1710.1 He succeeded as the 2nd Earl of Bute [S., 1703] on 4 June 1710.1 He succeeded as the 2nd Viscount Kingarth [S., 1703] on 4 June 1710.1 He held the office of Representative Peer [Scotland] between 1715 and 1723.1 He held the office of Lord-Lieutenant of Bute between 1715 and 1723.1 He inherited the Rosehaugh estate from his maternal uncle, but only after much litigation.1 He held the office of Lord of the Bedchamber from 1721 to 1723.3 His last will was dated 5 January 1722/23. From 9 December 1914, her married name became Anstruther. From 18 August 1925, her married name became Holland.